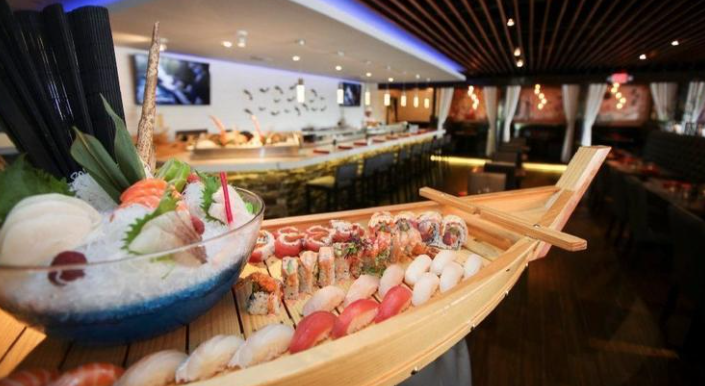 The husband-and-wife duo behind the 7-year-old Yakitori Sake House in Royal Palm Place have dramatically transformed the space best known as Gatsby’s Boca nightspot, in sync with the renovation of the Shoppes at Village Pointe. The striking, artistic ambiance with a 10-foot tall gilded Buddha boasts 11 hibachi tables as part of its pan-Asian-influenced Japanese cuisine. “People have always asked us to expand our offerings to include hibachi tables, as they offer a great group dining experience,” says Tina Wang, who is married to chef Jason Zheng. Signatures include spicy tuna gyoza ($11), tonkotsu ramen ($14), miso sea bass ($15), scallop carpaccio ($15), crispy pipa duck ($24) whole fried snapper ($28) and hibachi filet mignon and shrimp ($33). “Every corner was designed to excite the eye, and every area was carefully designed to accommodate different groups, from families to young professionals, executives to leisurely,” Zheng says. Lunch and dinner are served daily amid a marble sushi bar in the rear with curtain-draped, tatami room-inspired booths and charcoal tufted banquettes. An indoor-outdoor bar, with cocktails such as the green tea gin Jasmine ($12), bridges to a courtyard patio. A DJ spins on Friday and Saturday nights.